During daytime timed qualifiers at First Ontario Centre on Saturday, Nicoletti clocked the fourth fastest time while Goerke came in with the seventh fastest time. Team technicians made a few small changes to the YZ450F’s gearing, with everyone heading into the night show confident about being in a good spot for some podiums. In Saturday night’s action, Nicoletti shot out the gate on his YZ450F to snare the holeshot of Heat 1. He never looked back and held a cushy 11 seconds lead at the finish line. Goerke, who gated for Heat 2, got a mid-pack start but made some quick passes in the first corner, installing himself into third. After a few laps, he stuck a pass on Tyler Medaglia for second place, which Medaglia was able to reclaim before the end of the heat, leaving Goerke to settle for third. In the main event, Nicoletti got another great start, putting himself in second place behind Mike Alessi and just ahead of Goerke, running in third. Goerke, however, who was on Nicoletti’s tail, pushed him high in the second corner and was able to stick a pass on him. Undaunted, Nicoletti quickly chased his teammate down to reclaim second place. An on-fire Nicoletti then caught up with Alessi, who unwittingly handed the lead to Nicoletti, after Alessi washed out his front wheel in a corner. Although Nicoletti would lead the pack for about six laps, Cole Thompson, who had already claimed the series championship, managed to stick a pass on Nicoletti before the checkered flag was waved. Still, the night turned out well, with Nicoletti recording second place and Goerke third. 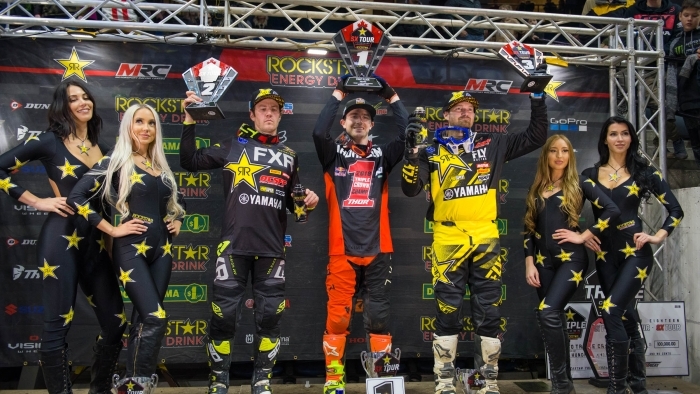 Round 4 of the SX Tour concluded the 2018 Rockstar Energy Triple Crown Series, which was launched with the six-round AX Tour segment back in February, followed by the nine-round MX Tour in May and the four-round SX tour in September. In the overall Triple Crown Series points chase, Goerke garnered a solid third place while Dillan Epstein sealed the top-five. Epstein rode all but the final two SX rounds for Rockstar Energy OTSFF Yamaha in 2018. Nicoletti joined Rockstar OTSFF Yamaha in September for the SX Tour and will ride the entire 2019 Triple Crown Series aboard the YZ450F for the team. “It’s been a long season and we have had our share of ups and down, but we kept digging deep and showed up ready to race each weekend. I can’t thank all the crew enough for doing a great job during the year. Andre, Monique, Renee, Risi, Kerry, Simona, Chris, Keith, Eric, Brad, Wil and all of our great sponsors. We look forward to a great 2019 season,” team manager Steve Simms said. Everybody at Rockstar Energy OTSFF Yamaha would like to congratulate Matt Goerke and Dillan Epstein for their third and fifth overall finishes in the Triple Crown Series. A tip of the hat to newcomer to the team, Phil Nicoletti, for his barnstorming runner-up finish in the SX Tour. Thanks to all our partners and team staff for helping to make 2018 another banner season for Rockstar Energy OTSFF Yamaha.